I've got one unit of Fire Eaters painted. I have a second unit to go that I did the flames on, but the first unit is done. At the very least, I know which is which on the table. Because they're always on the table together. I love these models. The Pyg is probably my least favorite, and he's still not bad. The other two are phenomenal though. So I sat them down and started working on them and Maximus. Maximus is mostly there but there's details yet on him. I ended up going with a confederate looking style from them. Between some of the caps (Gunnbjorn) and hats (Highwaymen or stuff I modeled), there's a western theme going for them, and I like the grey a lot. This jacket I got kind of carried away on though, and I liked it. The image I used for reference is not mine, it's a fire blower image I found on Google that probably has rights to it, so I won't go there. But googling Fire Blower will pull it up. 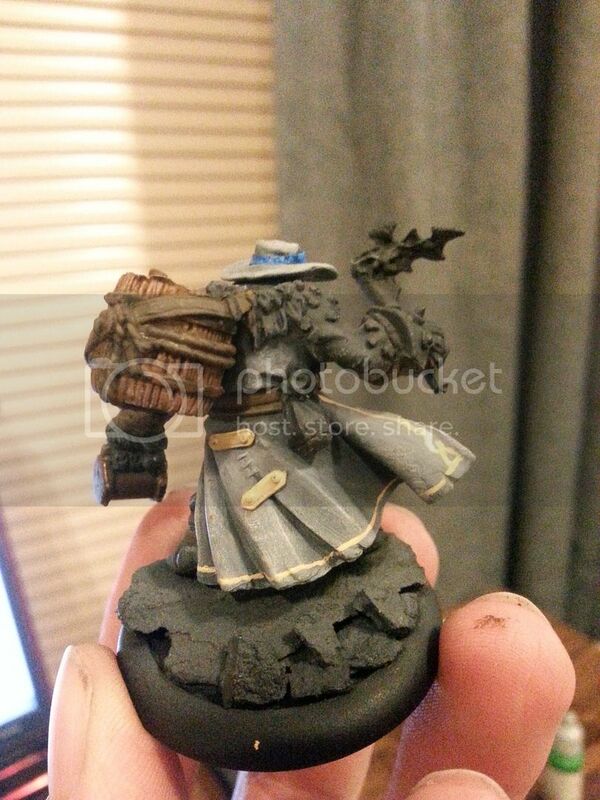 After some gloss varnish on the bottles and tophat and some airbrush OSL, this is where I ended up. The yellow OSL looks a little too green in this picture, and it's not green at all on the model. My background here is kind of rough. I found a good spot for lighting in the house and added some of my own, but I need to build another lightbox and figure out what I what in the back. Pretty wood grain isn't really doing it here, so idk. The black/blue stormy background I used to have was too much I think. Anyways. These guys are done. I have the second unit to do, and a whole ton of other stuff. My Highwaymen are partly done, Maximus... Now I have Pendrake, Bone Grinders (They'll probably never get painted lol), Kriels (Since I dislike them, they'll probably not get painted for a long time either), and I finally cracked and got Gunnbjorn, and he stands in an unpainted spot with Calandra and Borka1. Which leads me to terrible Dojo. Between Dozer (arguably) and the Highwaymen, I think Gunnbjorn's got a shot to be on the competitive scene without being toted by special snowflake players. Snipe on the Highwaymen is pretty solid, and makes them incredibly good. I started writing lists for him, and it feels like he just has too much going on. I want to spam Guided Fire, but that doesn't work on Kraye either. I may try double bomber w/Highwaymen and chaff (Fenns and such) and see what it does. What the Highwaymen need is a flare model somewhere. I really think they're good, but a flare would help so much. Without that, the Scats still have solid territory and it's hard to ignore them in an anti-cryx list. Secondly, the Efaarit are inbound. I'll need two of those for the models alone. There's some people repeating the anti-Hunter argument with these guys, and if you've seen my Kraye reports, you know I hate hunters. With a passion. Efaarit, on the other hand, while not obviously competitive, can do work. For the price of one hunter, I can get a AP shot at 1 higher POW (basically +2 compared to the pow6 on the Hunter) with all the same tricks a Kraye Hunter has. People who like the Hunters spout how amazing they are on Kraye. Well, Efaarit run just like that, without focus. Sure, damage isn't boosted. I'm ok with that. On top of that, they completely ignore what I find frustrating about the hunter, the struggle to kill a grunt with a POW6. Sniper bypasses that completely. Just need one reliable shot into a grunt to clear a lane? RAT7, RAT9 with aim, pop, walk away. Shieldwalled IFP? One point, done. That's gold. I'm willing to pay 6pts for 2 of those every turn. Will it go in every list? Absolutely not. But I gaurantee I'll be finding places for them in my gunlines. They're not bad at all. It's going to be a good year for trolls. Other news. I'm dabbling in commission work. You saw the Kraken. There's more inbound from that it sounds like. I'm also doing a display piece with my Dynamo, so that's coming. My wife just got ahold of the 2player Circle kit, so her army just pretty much doubled, and more importantly, she got Skinwalkers. So some of that may come across here too. I've also got the Croc rematch half written and that'll drop this week as well. Stay tuned folks. All like, three of you.